Thanks to people's care, migrating red-crested cranes often stay in the marshes in Heilongjiang during all seasons; I was touched by the harmonious relationship between birds and humans. This became my inspiration for creating 'Homecoming'. 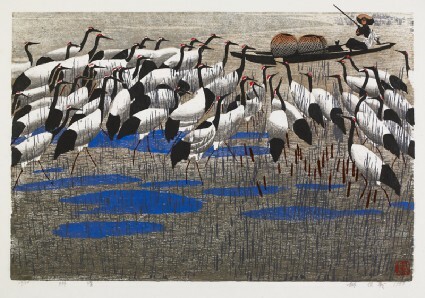 Hao Boyi began to produce woodcut prints in 1959 following his settlement in the Great Northern Wilderness along with the 100,000 soldiers sent there to cultivate the land. 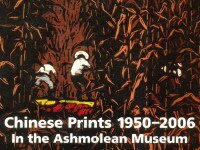 Hao studied printmaking at the Lu Xun Academy of Fine Arts in Shenyang in 1960, and after his return to the state farm in Heilongjiang he played a leading role from the 1960s to the 1980s, in shaping the Great Northern Wilderness School of prints by assembling talented artists who had been sent to the wilderness from all parts of China as labourers. Most of the second- and third-generation print artists in Heilongjiang studied with him. Hao mainly uses water-soluble colour printing techniques with a lyrical and decorative style in a simple form and has adopted birds, wild animals and country scenes as his favourite subject matter.